Hacktivism attacks will not change Israeli policy but for sure their operations could represent a dangerous cyber threat for any government. Anonymous has started a cyber offensive against Israel to protest for the attacks on Gaza, the hacktivists have defaced and taken offline hundreds of websites, such as The Jerusalem bank and Israel’s Ministry of Foreign Affairs, and have exposed information stolen during the hacks. The complete list of web sites attacked has ben published on Pastebin, a second list related to a Phase 2 of the attacks has been also published on the same website. According Israeli Finance Minister Yuval Steinitz over 44 million hacking attempts have been detected from the beginning of the operation #OpIsrael, although most have not been successful. The Minister highlighted that non-government web site reported serious damage, the offensive has created problems primarily to private companies, small business is usual more exposed to cyber threats due limited economic resource. It cannot be ignored that in the past the impairment of subcontractors infrastructures has made possible the exposure of sensible information. Majority of attacks hit governmental sites including the Home Front Command and Prime Minister’s Office with poor efficacy. 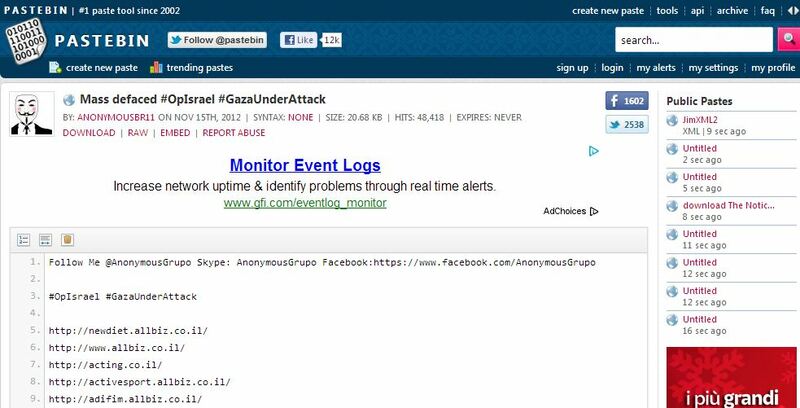 The Israeli minister also explained that many attacks have been originated in Europe and US, it’s impossible to assign to the offensive a specific geographic connotation, today (11/19) another Pakistani hacking group also came forward in support of GAZA by taking down multiple big Israeli sites and deface all Microsoft related Israeli domains including Bing, MSN, Skype, Live and other. In an official communicate Anonymous representative have expressed all their rage against Israel condemning its publicly threat to shut down all lines of communication in and out of Gaza. The hackers haven’t limited their operation to defacing but they have also violated every target not properly secured exposing private info of tens of thousands of Israeli citizens and personal data of 5,000 Israeli government officials. 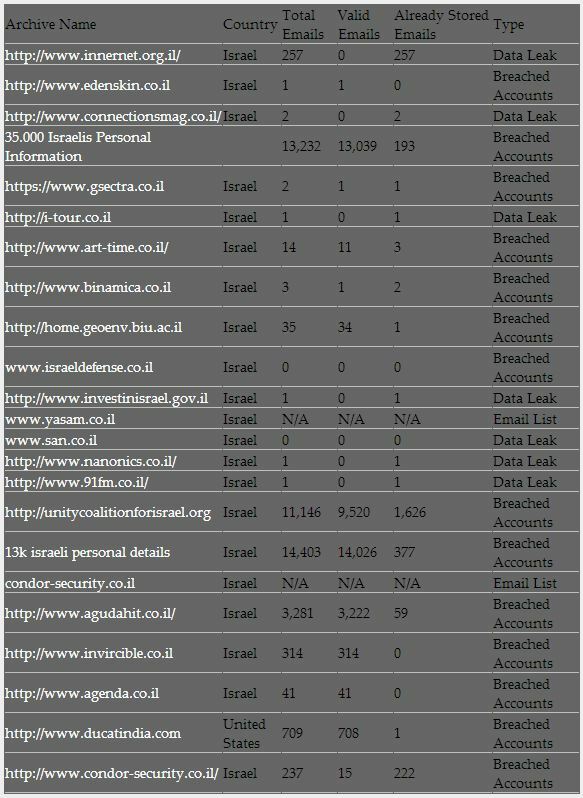 As usual a great source of statistics on the attacks is represented by the web site OZDC that analyzed the leaked data providing meaningful information of the #OpIsrael. Anonymous is expressing its full solidarity with the Palestinian people, the interest is high to the point that some have even suggested an infiltration of members of Hamas among its members, I exclude that possibility, on internet is also circulating the news that Anonymous has created “care package” containing contains information on evading IDF surveillance for residents of Gaza to use if Israeli will attack Internet connections. The challenged IDF published on-line a portal to fight “misinformation” concerning the IDF and Israel. The site propose a game that involve visitors in every kind of on-line activities aimed at providing a positive image of the state. The Web site provides also documentation on the attacks on Gaza and information about attacks that Israel suffers as shown in the following pictures. For sure the group of Anonymous will continue to the bitter end its offensive … at least until the attacks will not be interrupted. My opinion is that Israel is conducting a so aggressive offensive on Gaza to verify the response of international community to its possible future military interventions, I obviously refer to a possible attack on Iran. The government is evaluating the efficiency of its war machine and also the interferences of other countries in its decisions. I hate wars, there are situations that children should never live, I dream a civil society but the hatred in the region is unlikely to bring peace.